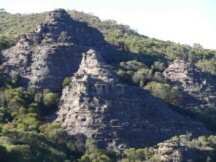 The 45th Paddy Pallin 6 hour rogaine was held on the Newnes Plateau north of Lithgow. Some photos taken by competitors. 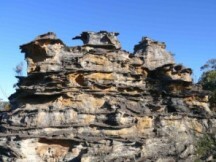 The area is a mix of plantation pine forest and native bush with some beautiful rocky pagodas. The course has many marked roads, as well as many unmarked trail bike tracks. The course is set at elevations between 1000 and 1200 metres, so you won't have to be a mountain goat to have a good day out. The setters have created a course over a larger area than typical that will offer plenty of choices and diversity for those wishing to roam, all without feeling too much like baa baa black sheep after contestants disperse. A course for the fabulously fit and family fun alike. 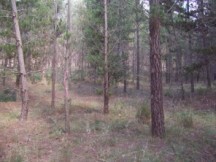 The course will be moderately fast within the open pine forests and on tracks, with light scrub for those seeking the challenge and rewards of the adjoining bushland. Firstly a quick explanation. Rogaining is a long distance navigation sport where teams of two to five people use maps to find as many checkpoints as possible during a set period of time. Traditionally, rogaines last 24 hours but there are shorter ones. The Paddy Pallin Rogaine is six hours long. 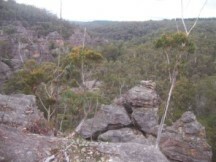 This year our intrepid quartet, Bronwyn, Kerrie, Matt and myself set off to the Newnes State Forest near Lithgow. We arrived after dark on Saturday night. It was a little eerie at first; lots of mysterious tents and camp fires in the mist! And it was cold, my goodness it was literally freezing. Bronwyn was scraping the ice off her tent and there was ice inside my tent! However, we were soon warmed by the friendliness of our fellow participants, and the generous hospitality of our hosts who provided generous portions of hot delicious food. It was above freezing in the morning but still very cold. Thankfully the predicted sleet and rain did not appear and the day soon cleared to become cool, bright and sunny - perfect weather. After the briefing came the count down, the siren and then we were off! There were over two hundred and fifty teams and each team had at least two people in it - hey that is a lot of people! When we started I had so many layers of clothing on I looked like the Michelin tyre man but there were some very serious competitors who were wearing barely anything! I learnt that rogaining is less intense than orienteering i.e. you have more time to admire the scenery and the scenery was FANTASTIC! Huge gorges and towering pillars of rock. Our team covered about 23km which for a largely novice team (Bronwyn was the only one who had been rogaining before) was excellent going. There were about 132 teams in our section and we were in the top fifty percent. I must say I have never been part of a better team. We were all keen to do well but always put our friendship and the wellbeing of our team mates first. Please pass on my thanks and best wishes to the Committee and the organisers for the Paddy Palin Rogaine. The event was run faultlessly, and the course was one of the best - catering for all standards, and providing world class scenic lookouts. Even the weather was great. What more could we want? Congratulations on a very well run rogaine - we have reached new high levels of achievement through a lot of effort by you and your support team. Thanks to you all! The waterproof maps with all the information on the one sheet and waterproof control cards (were they necessary?) were excellent. A small improvement suggestion: In the checkpoint list, identify those checkpoints having an additional description in the notes similar to those you carefully noted as being near cliffs. Had some difficulty finding the Hash House [could have been exhaustion! - Ed]. The "Navlight" pens were excellent. An individual printed team report immediately on conclusion of our rogaine, very quick compilation of the results and resultant presentattion without delay was a very significant and welcome improvement. 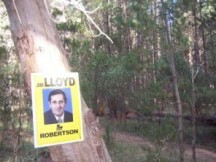 We hardly recognised that we were very near to the location of the 2005 Paddy Pallin Rogaine. The map was different and, of course, different checkpoints! Success with the weather, even if it was cold. In all, a very good day. Thanks again! phone: 02 9484 4403 after 8pm.